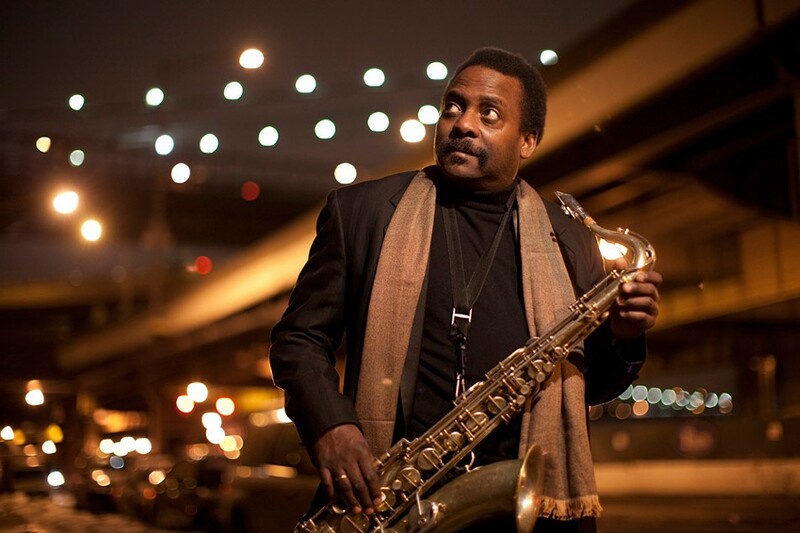 PHOTO BY JIMMY KATZ Saxophonist David Murray will perform with Kahil El'Zabar at the Bop Shop on Monday. The duo recorded a live album, "We Is," in 2000 at the Bop Shop when the store was located in Village Gate. When David Murray was growing up in Berkeley in the late 1960's, the Bay Area was a fertile place for music. Groups like Sly and the Family Stone and The Whispers were emerging from the region, and Murray's own home was overflowing with melodies. His mother was a pianist and music director at the family's church, where his father played guitar. One of his brothers played clarinet, another played piano, and his cousin played trumpet. Murray took up the saxophone, flute, and piccolo, and by the age of 12, he was backing singers. At 13, his trio won a contest with an unusual prize: a three-year gig playing every weekend at Shakey's Pizza Parlors. "We'd play tunes like 'A Taste of Honey,' but with a jazz flavor," says Murray, who performs at the Bop Shop on Monday, June 5, in a duo with Kahil El'Zabar. "I was going toward jazz and I didn't even know it. I always wanted to be in the foreground, not in the background. I didn't want to play with bad singers." Murray also played in R&B bands, but when he discovered saxophonists like John Coltrane, Coleman Hawkins, Sonny Rollins, Albert Ayler, and Ben Webster, he got serious, analyzing them and copying solos from their records. "It took me a while to set up my style," Murray says. "I studied the giants and they all had their own styles. You get tired of mimicking and if you're serious you develop your own style." Four decades later, Murray is not only one of the greatest improvisers in jazz, he is among the most technically brilliant sax players. Since the mid-1970's he has released more than 150 albums, including "We Is: Live at the Bop Shop," a duet with El'Zabar. Released in 2000, the disc was recorded at a well-attended concert at the Bop Shop's previous location in Village Gate. After playing in high school bands, Murray won a California state scholarship and decided to attend Pomona College where jazz scholar and drummer Stanley Crouch was teaching. When Murray attended a rehearsal at Crouch's home, he found jazz greats Bobby Bradford and Arthur Blythe in the living room. Pomona was a strong environment for jazz, but after three semesters, Murray traveled to New York City for an independent study. "Things went pretty rapidly. I started playing gigs. I started making records. Finally, after a while, I forgot about this whole school thing. There was a window I had to climb through and I climbed through it." Murray became a major player in the thriving "loft jazz" scene. Almost four decades later, in 2012, he returned to Pomona to accept an honorary degree. In addition to his own octet and big band, in 1976 Murray became a founding member of the World Saxophone Quartet. He and the other three saxophonists — Oliver Lake, Hamiet Bluiett, and Julius Hemphill — were established players when they were invited to a New Orleans college for a series of workshops. They discovered that they could play powerfully together without a rhythm section. "When we first got together everybody would try to out-blow each other," says Murray. "I used to call it Star Bores. It sounded like some kind of contest. Finally we decided to make music together. I got on one end, Julius got on the other. He anchored the band; I played the rhythm. One guy would step forward and the other guys would accompany him." In addition to the wonderful blend of saxophones, the group was capable of moving seamlessly from traditional jazz to the farthest reaches of the avant-garde, sometimes in the same tune. "We had a great composer in Julius Hemphill," says Murray. "Everybody knew a lot of tunes. We all wrote in different ways. We were all strong players, and we developed a sound together." Over his career, Murray has branched out, composing for film, theater, and opera. He has collaborated with poets, including Amiri Baraka and Ishmael Reed. "You get a poem from someone, put it on the piano, and after a week or so, the words turn into music," Murray says. "Next thing you know, you've got 20 people singing and you're making an opera." He has also worked with artists like Cassandra Wilson and Taj Mahal, and he recently created big band arrangements for Macy Gray. It was a departure for the soul singer. "They use all these tricks in the studio to expand their horizons," Murray says. "My approach is to listen to someone's voice and build a world around it, try to make it more personalized. When a singer hears that back, they come to appreciate their own compositions more." At the Bop Shop, Murray will once again be playing in a duo with El'Zabar. Though El'Zabar is best known as a percussionist, Murray points out that he does much more. Aside from being the founder of the Ethnic Heritage Ensemble, El'Zabar has worked with Stevie Wonder and collaborated with Julie Taymor and Garth Fagan on "The Lion King," Murray has nothing but admiration for him. "It's incredible playing with him," Murray says. "He's a very soulful singer, he plays percussion, and he dances. He's a visionary and a poet. When we play, it doesn't sound like a duo, it sounds like a real band."